The news cited in this column relates to variable renewable energy systems (vRES - wind and solar); the rule of the obvious appears to be considered irrelevant by vRES proponents. 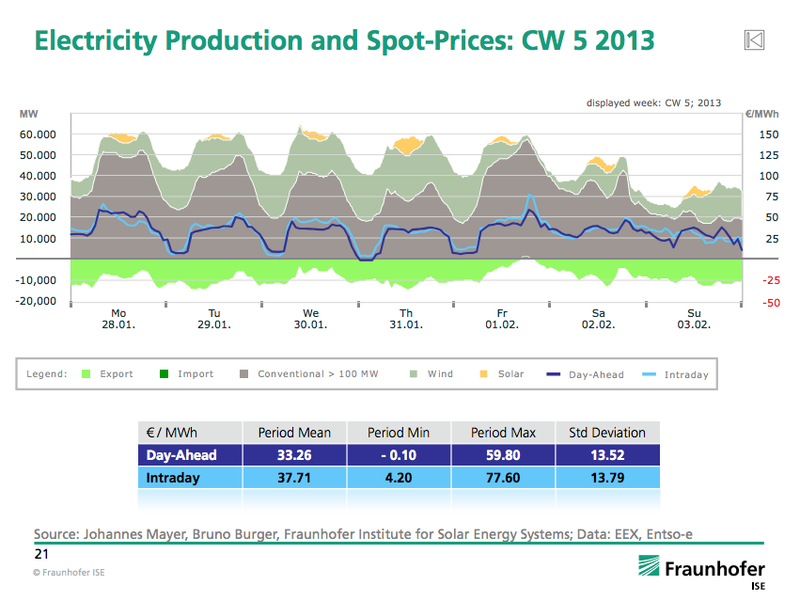 The German Energy blog reported on solar capacity additions in Germany, indicating the pace of annual additions has slowed from ~7,500GWp per year (since 2008); searching through the links it appear the past 12 months have seen less than 5,000GWp added, and growth may still be slowing. Because Germany now has feed-in tariff rates that drop with installed capacity, due to rules instituted as solar installations soared. Apparently the lower rates may be seeing lower new installations. Reuters was one outlet reporting on this weeks filing for insolvency by Conergy, "once Europes' largest solar company." Renewables news site Recharge reported that "Conergy unexpectedly filed for insolvency." Given the contraction in solar as rates are trimmed due to the rapid inflation that accompanied solar's ascension to only ~5% of all generation (in 2012), it's surprising any entity could view the issues being experienced by Germany's solar sector as unexpected. A report sympathetic to renewables has predicted another hike is coming for Germany's renewables surcharge (EEG) in 2014 - following an enormous jump in 2013. The German Energy Blog implied the same thing, noting the deficit associated with the EEG had begun increasing again as of May, after showing a steep decline earlier in the year. German wind and solar output for the first half of 2013 was 36.7 TWh, a drop of 6.4% compared with a year earlier, German renewables research group IWR said Tuesday. In June, however, there was a pick-up in renewable generation, with wind output up 18% year-on-year to 3.4 TWh, while solar output in June was up 16% at 4.3 TWh, it said. Ah - it appears the growth in the EEG deficit position could be explained by the growth in renewables - and the earlier contraction seems like it could be attributed to a decline in vRES production. The big vRES output in June accompanied record low market pricing. No surprise there, at least not to me having recently written The diminishing value, and increasing costs, of wind and solar generation in Ontario. I'd expect increased vRES levels to drop pricing. 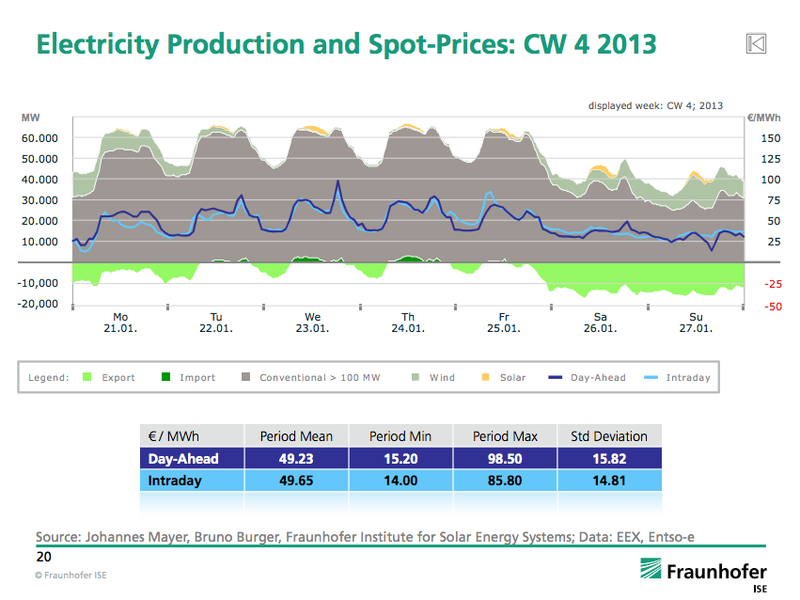 Germany tends to export electricity at times of high demand and import at times of low demand, when prices are lowest. Because Germany has sufficient generating capacity (even after the sudden nuclear shutdown of 2011), power imports and exports are based mainly on price, not on any need to prevent blackouts. It sure looks like when vRES is producing the market rates are low and the export levlels are high. Other plants are noted in the article. In all cases low utilization rates for the generators are claimed to make the operations unprofitable. There is now a process where the generator informs the government of the desire to close the plant, and I suspect most of them hope the government rejects the request in which case they'll be compensated for keeping the capacity available. The universe, it seems to me, is unfolding as it should. The end of profitability for the only generation exposed to the market price in Ontario [unregulated hydro] serves as a warning to tread very carefully in introducing capacity payments, just as the explosion of costs in Germany due to procuring only ~8% of all generation from wind, and even less, ~5%, from solar, is a warning to tread very carefully in instigating the FIT mechanism. Both, it seems to me, should be avoided. Economics dictates both the declining value that comes with increased vRES capacity, and the need to pay for firm capacity to maintain a sector capable of meeting peak demand periods. The only real surprises are in the reality-defying explanations from renewables advocates interested only in building another wind turbine - topped with another solar panel.